Explanation: Twenty five years ago humans roamed the Moon. Pictured here during the last moon landing, scientist-astronaut Harrison Schmitt was photographed standing next to a huge, split boulder. Apollo 17 was one of six missions that landed humans on the moon and returned them safely. 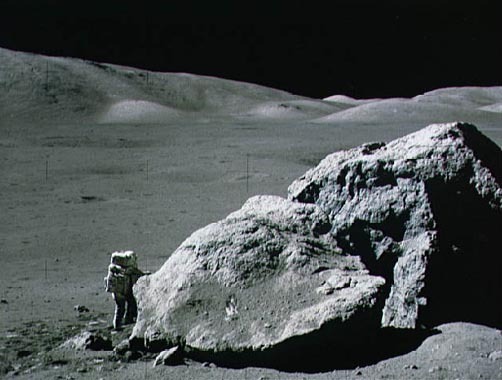 Apollo 17 explored the unusually dark terrain at the Taurus-Littrow landing site, deployed explosives to test the internal geology of the Moon, and returned the most rocks of any lunar mission.